Contributions to my campaign would be greatly appreciated. Please make your check or money order payable to "Vic Kohring for U.S. Senate" and mail to 161 Flag Circle, Wasilla, AK 99654. I would be grateful for any dollar amount. The Federal Elections Commission states that "A contribution of money may be made by check, cash (currency), credit card or other written instrument." 100.52(c). Regarding limits, "Individuals...may contribute a maximum of $2500 per election to a candidate's campaign." 100.1(a) and (b)1. I would also be pleased to obtain your help in others ways, such as volunteering with a phone bank, placing a yard sign or writing a letter-to-the-editor. Please email me at kohringforalaska@ gmail .com or call (907) 352-3582. 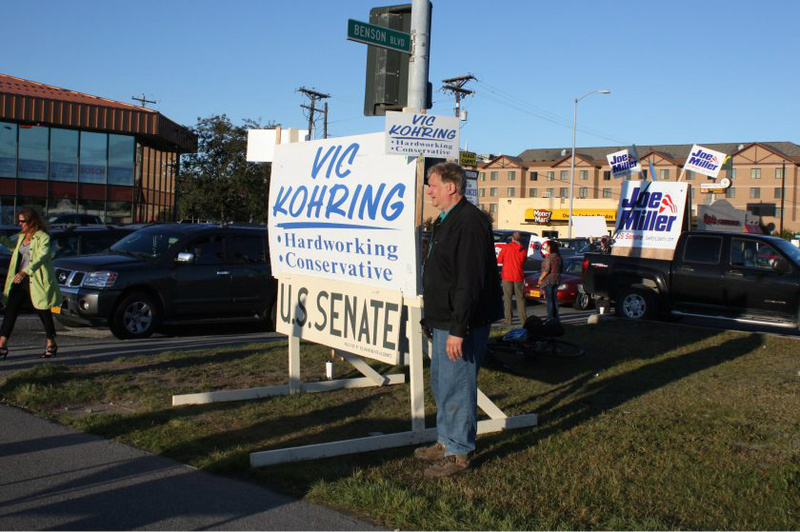 Campaigning in mid-town Anchorage along Benson Boulevard (pausing momentarily while waiting for the signal light to turn green to resume waiving) in the early morning hours of Primary Election Day on August 19, 2014. Photo courtesy of Laurel Andrews of Alaska Dispatch News.